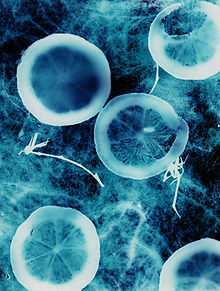 A color photogram of lemons slices and tomato stems. The background texture is enlarged paper grain. A photogram is a photograph that is made without a camera. Something is placed on top of some photographic paper (or a similar material) and then shining light on it. At the end of this, you get a shadow picture. It usually has different tones. This depends on how transparent the object is. This page was last changed on 30 August 2013, at 21:52.